Pat, Miranda and Mitchell all went with us to the Tough Mudder on Sunday. Between the 3 of them, they had 4 cameras and took over 700 pictures. That is too many pictures for a full recap on the blog. I created a Picasa album with 160 photos captioned to document the entire course. Click the little picture below to read/see the whole story. Here is a brief recap, as brief as I can make it. You know I have a tendency to talk a lot! Number of obstacles Christy #1 completed - all 29! She is the Toughest Mudder. Teammate injuries - Irene hurt her ankles; Brian had terrible chafing from wearing loose shorts; Brian, Irene, Christy #2 and Wayne all have big bruises; Christy #1 came out whole, just a little sore. Time to complete course - 5 hours for me, Irene, Brian and Christy #1; 4 hours for Wayne and Christy #2. 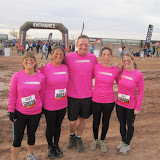 The four of us walked the last 7.5 miles to accommodate Irene's ankles and my groin pulls. Strongest teammate - Irene is freakishly strong. Seriously, it was frightening. There were six of us on our team - Christy #2, Wayne, me, Christy #1, Irene and Brian. There were two obstacles that I was most afraid of - the Arctic Enema and Walk the Plank. Arctic Enema is a big ol' dumpster filled with ice and water. You jump in and swim across, going under the barrier in the middle. This scared me for two reasons, 1) I'm really sucky at being cold. It's a very serious issue I have. I moved to Phoenix for this exact reason. 2) My biggest fear is to be deep under water. Granted the barrier was only a couple feet down, but that is still deeper than I am comfortable with. This is Enemy #1: This is me jumping in! And this is me afterward: I tried to swim under the barrier off my initial jump in and I ran smack into the wood barrier with my head. Frick, that hurt! I had to come up, take a breath and try again. I'm an idiot. And I now have a bruise on my skull. But I did it and I didn't die! Walk the Plank is a 15' high platform that you jump from, into really cold water. This scared me for the same two reasons as the first one. Cold and being under water. Jumping into water is the absolute worst for me. When I go under I get all disoriented, I don't know where up is, I don't know how deep I am. I panic. It's terrible. This is Enemy #2: This is me jumping in! This is me afterward: Yes, I was crying. And shivering. And terribly unhappy. Everyone agreed that they went way deeper than they were expecting. I think I went about 7900 feet under water! It freaked me out so much that I started crying while I was still under water, which of course made me panic even more. I am an idiot. But I did it and I didn't die! They say that this is how you overcome your fears. Whatever. I am still just as terrified, probably even more so, of jumping off high things into water. I HATE IT! My favorite obstacle was this: They bulldozed away sections of the road and you had to jump the trenches. I like to jump things! Of course, this was the obstacle that injured me. I am not very flexible and I pulled both groin muscles in the jumping. And I'm not coordinated enough to jump and land on my leading foot and continue running. I can only do the grade school running long jump style of jumping where you land with both feet. Landing solid like that and not continuing the momentum really screwed up one of my heels. I think I bruised it like I bruised my skull. I am an idiot. But it was sooo fun! The worst part of the race was not my two hated obstacles, but just plain old being cold. The temperature was in the 50's with no sun at all. Through the course of the race I added on dry gloves, a dry hat and two coats (carried in Pat's backpack) but I was still shivering uncontrollably for the last two hours. I am such a wuss - everyone else made it through with just a long sleeve shirt. They were cold, of course, but no one else was disabled by the cold like I was. At one point I could barely stand up. Miranda and Mitchell had to stand around me for body heat until I was able to go again. But despite being completely miserable, I was having fun! There were two obstacles I didn't even attempt. Both were near the end of the course. My excuse is that I was cold, which is so lame. The first skipped obstacle was Electric Eel: Those are electric wires, some of which are live and shock you. That wasn't what scared me. Brian and Christy said they barely hurt. What prevented me from doing it was that the tarp was covered with water and ice cubes. I was so cold at that point I could not make myself get wet again. I am weak. The other obstacle was Shock Therapy: There were four sections of these electric wires to run through. I watched grown men get shocked and fall face first into the water. This one was a combination of not being able to make myself submerge in cold water and being scared to get hurt. Christy and Brian said the shocks hurt like hell. I think in the state I was in at that point, the shocks would have killed me. I am a wuss. Weak Mudder. Tough Mudder is all about camaraderie. Some obstacles, like the walls, you can't do by yourself. People you don't even know jump in to help you. Brian heaved two girls over the walls. A team from Intel helped all of us up the half pipe: It was awesome! I wanted to hate the Tough Mudder because it's expensive, then on top of that they hit you with a lot of stupid fees and they don't donate any of the registration fees to their charity, Wounded Warrior Project. However, I loved it! It was incredibly well organized, from registration to the best-ever water/food stations on the course to the finish line area. The volunteers were amazing! One lady peeled a banana for me so I wouldn't have to take off my gloves. There was applesauce at two of the water stations and the volunteers even opened them for us. There were port-a-potties on the course, everything was incredibly spectator-friendly, they gave out Under Armor t-shirts. I was a skeptic going in, but I was proven wrong. This was a top-notch event. At the end, I was a little disappointed in myself for being Weak. If they could just hold one in the summer!! I love heat. I could be Tough in the heat, I just know it!